This is one great book for beginning artists to painting pen and wash techniques. When you are not painting, and one rainy days, get hold of this book and read it cover to cover. Claudia Nice shows you the various means of painting watercolour using the pen and wash techniques, from old barns to light houses; from old barn doors to moss-filled masonry. 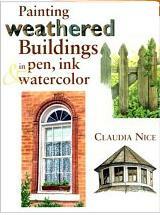 The author covers her subject well, teaching the simple techniques like scratching the paper to show highlights to mixing dark washes to depict the building storm by the sea. Nice also mentions quite a bit on brushes as well as the colours used. Best of all, she covers the subject of wooden subjects, from broken barn doors to timber fencing and aged wooden shakes. She teaches you how to paint the grey undercoat (and how to mix the colours) to inking the lines to depict wood grains. I especially like the stonework part - a subject many of us painters would find difficult to paint. Here the author shows how easy it can be by obeying some simple rules. This book can be obtained from local bookstores but is rare. However, there are two versions. Mine is the hardcover one which costs quite a bit. If you can't afford it, go for the softcover one. What do you do when inspirations dry up?